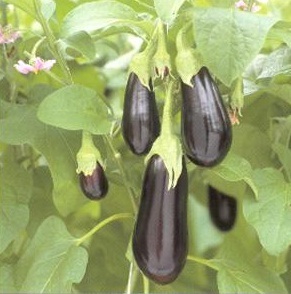 Aubergines (Solanum melongena) are also known as the ‘eggplant’ because the fruit of earlier varieties were white and egg-shaped. They would ideally be grown under glass, needing a long, hot summer, and not surprisingly, were first recorded in India. They are a member of the potato and tomato family. The most common varieties produce attractively coloured, deep purple elongated oval fruit, although other varieties can be light purple with creamy streaks to all white. The taste of the flesh is the same across all varieties and has a mild, slightly astringent flavour and a spongy texture. In cooking, it absorbs the flavour of neighbouring ingredients very easily and is popularly used in Asian recipes. Seeds are best sown in containers under heat in early spring two to three weeks to germinate. Prick out into individual pots to grow on and transplant into soil rich in organic matter. Keep well watered, stake firmly and apply plenty of liquid fertiliser. Remove the growing tip to encourage more side shoots when the plants have reached 50cm. When four or five fruits have formed on each plant, remove lateral shoots. Pollination can be problem as the plants are grown indoors and the flowers are less attractive to insects. Dabbing each flower with a small paintbrush or cotton wool ball is a good substitute. Aubergine plants under glass are susceptible to attacks from aphids and whitefly. Apply control measures regularly and watch for infestations. Bacterial wilt often affects aubergine. Remove affected plants immediately and destroy them.